Welcome to Wharf Aquatics Marine Dept. 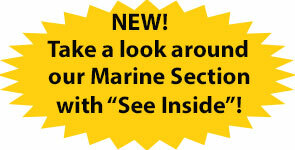 The marine section was opened in January 2005, making Wharf the complete aquatic store in every sense. 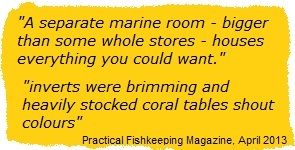 We were very pleased when just 18 months after opening, readers of Practical Fishkeeping magazine voted the marine section number 1 in the UK, and again in 2008 and 2009! 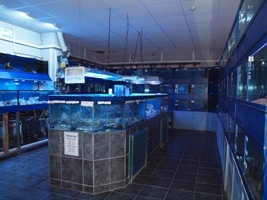 The marine room houses two large fish systems, three large invert systems, two large frag tanks and a seahorse system. A large range of dry goods are stocked, with products from D-D / Deltec, Seachem, Arcadia, Bubble Magus, Red Sea, TMC, Salifert, Vortech, CaribSea, New Era, Julian Sprung, Eheim and many more. The livestock at Wharf Marine is brought in weekly by our own imports and through reputable wholesalers. Fish are well represented at Wharf Marine, giving our customers a superb and ever-changing choice - whether it’s a reef tank or fish-only, we have fish to suit your setup. We also stock a wide range of inverts including many hard corals, anemones, shrimps, crabs, algae, molluscs, urchins, feather worms, starfish and many more giving our customers a wide and varied choice (See our Current Stocklist). The right advice is a key part of a reef keeper’s success, and at Wharf Marine the staff have years of experience to call upon, advice is freely available to the inexperienced and the experienced alike. Water testing is available, so we can advise on the right livestock for you. A warm welcome awaits you at Wharf Marine!